Moscow plans to lay on the razzmatazz for thousands of fans at the tournament in June. Russia’s campaign to popularise sport by hosting major international events will see the Rugby World Cup Sevens coming to Moscow for the first time on June 28-30. The tournament, to be held at the city’s 80,000-seat Luzhniki Stadium, will attract thousands of visiting foreign fans, and could prompt Russians to turn out in bigger numbers for the sport - which has only taken off in Russia in the past few years. Organisers say they will also turn on the showbiz razzmatazz, with live music acts, to tempt Russians to come see the games. Dmitry Shmakov, Russian rugby’s director of development, says he is confident that at least 15,000-20,000 fans will attend. Tickets and travel packages are on sale via the event’s website. Prices are reasonable for international events (first-day tickets sell at 150-400 roubles ($5-$12) and third-day tickets, when the final game will be played, for 500-1,800 roubles ($16-$57). Some websites can deliver tickets to the UK within a week. Special preparations are in place for the tournament, as Luzhniki currently has artificial turf. Real grass will be brought in from the Tula Region and laid for use at the rugby tournament and the 2013 IAAF World Championships in August. Workers will start replacing the turf at Luzhniki on 11 May. In late summer the stadium will be closed for reconstruction ahead of the 2018 Fifa World Cup. Russian fans hope that the World Cup Sevens will give a powerful impetus to the development of rugby in Russia. Despite the impressive progress made recently by the national team, the game is not hugely popular and is generally not supported by the authorities and corporations. “Two or three million euros would make a real difference in any European championship. In Russia, this is the annual salary of some football players. When we tell senior executives about rugby, we try to make them understand that this sport can be used to address important social issues. How can we involve young people in rural areas? “Rugby is an excellent sport. It moulds the character, suits everyone, and requires insignificant investment compared to other sports,” says banker and philanthropist Alexei Sokolov, whose Zenit Bank is general sponsor of the World Cup, putting in 500,000 euros ($650,000) for the event. Mr. Sokolov’s bank finances the Russian national rugby team and in 2008 he founded the National Charitable Foundation for the Development of Children’s Rugby. Russia will have a tough struggle on the field, however. It played its first full Rugby World Cup last year, losing all its four matches and finishing last in its group. But it did leave its mark on the tournament. Not only did the Russian Bears set a new fashion for winter hats with ear flaps, they also scored three tries against Australia, despite being comprehensively beaten 68–22. 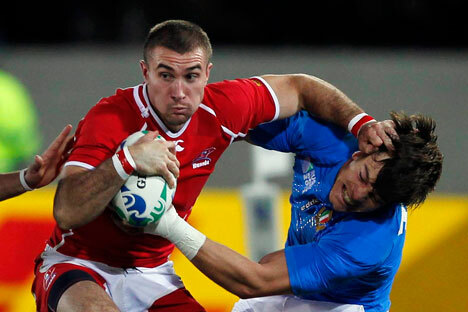 No other team scored that many points against the Wallabies during the tournament.In all, the Russians scored a total of eight tries, setting a record for tournament newcomers. Last year, the Russian Rugby Union said it wanted to host the 2023 Rugby World Cup.